A group of African-American women were some of the brains behind the successful launch of Friendship 7—the space capsule in which John Glenn orbited the Earth three times—, and would later participate in the Apollo 11 program. 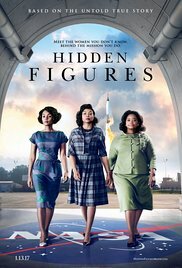 Hidden Figures is a winning movie on many levels: it brings girl power to new heights, showing that great minds aren't defined or confined by gender, or color, for that matter, and celebrates the remarkable achievements of African-American women at NASA, who were pioneers in many ways. Hidden Figures is also a great example that there are many stories to be told in the categories discussed above, and they can be done without compromising esthetics or involving profanity. I was very impressed with the topic of the movie, with the all-star ensemble cast that precisely due to gender and race differences make this movie work to perfection. I was quite taken with the musical score of the movie that made ample use of theme songs to highlight situations, such as Katherine running almost a mile every time she needed to use the bathroom at the rhythm of the toilet song. The indignities that were part of the everyday life for African-Americans are cursory—times were beginning to change, and the setting of the movie is not the Deep South but West Virginia—, but told with pathos. "Civil Rights ain't always civil." "Here at NASA, we all pee the same color." '"But within these walls who, eh...who makes the rules?" "Progress is a double-edged sword." This one is on our to be viewed list. My husband, who's a big fan of NASA, has been eager to see it and since he controls the remote I'm sure we'll get around to it soon! That's funny, Dorothy! When you get to see it, I think you are going to like it. There is plenty of NASA stuff (behind the scenes) that your hubby will like. I loved, loved, loved this movie! There was much to love, Judy. I also loved this - very entertaining indeed. I CANNOT wait to see this! It looks amazing. I hope you like it, Kate. I just saw it last weekend...Wow! Amazing! Definitely a 5-star watch for me. I'm glad you loved it. I enjoyed this one at the theater. Then I got the book because I wanted to know a bit more about their lives, but I haven't read it yet. I hear it's quite different than the movie, though that's okay. I thought their stories very inspiring. That must make for entertaining reading.